John McAdow deeded William Sullivan [both of Guilford] 100 acres located on South Buffalo adjoining Samuel Hodges and Edward Ryan. Caleb Sullivant and Elisabeth Kirkman received a marriage bond. Wm. Sulivant and William Ryan are listed as securities. Henry Pollack and William Sillaven were witnesses. Will of Daniel Sullevan, dec'd. William Siilivan [of Rowan County] deeded Smith Sillivan [of Guilford County] 43 acres located on South Buffalow adjoining Saml. Hodges, Ryan, and Richard Ozment. Robt. Mayben and James Sillivan were witnesses. William Sillivan Senor. [of Roan County], Thomas Stack, Elijah Stack and Levin Stack [of Guilford County] deeded David Stack [of Guilford] 163 acres located on South Buffaloe adjoining John Ryan. Henry Jinkins and William Kirkman were witnesses. Will of William Sullivan Sr., decd. Heirs: son John, son David, and "all children"
Eleanor (Sullivan) Fouts, was the only child that lived until 1880 and listed Maryland as both places of birth for her parents in the 1880 Census. Eleanor Smith was born April 1763 in Rowan, Davidson County, North Carolina and died Nov. 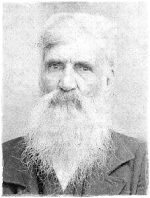 It is believed that William Sullivan Sr. too, is buried in the Fair Grove Methodist Church Cemetery, without a marker.